A spectacular small tree, Crataegus laevigata 'Paul’s Scarlet' produces masses of deep scarlet-pink, double flowers in May and attractive small red haws in the autumn. The deeply lobed foliage is dark-green with a slight gloss, turning yellow and bronze for autumn. 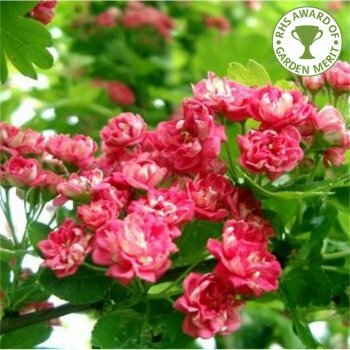 This award-winning Double Crimson Flowering Hawthorn tree will reach an estimated height and spread of 5 x 4 metres in 20 years. Crataegus laevigata 'Paul’s Scarlet' is an extremely hardy ornamental tree that will grow in almost any condition or soil including, coastal, exposed, polluted or damp sites. As its common name of Hawthorn suggests, it has sharp thorns on its branches and provides a safe home for a variety of wildlife. For a very similar Hawthorn tree with double white flowers see Crataegus laevigata ‘Plena’. Our pot grown 'Paul’s Scarlet' Hawthorn trees can be planted at any time of the year. Start by removing weeds and grass within a metre of your desired planting hole. Dig a square hole as deep as your root mass and approximately 2x as wide. To help the tree establish more effectively, sprinkle root grow in the hole. If you’re planting Flowering Hawthorn in spring or summer, water well for the first few months. Increase watering if there are extended periods of hot or dry weather. If planting in autumn, you may only need to water a little. 'Paul’s Scarlet' Hawthorn trees can be pruned in summer (after flowering) to help maintain a clear stem. By pruning the lower branches you will raise the crown, creating a more attractive form. If it requires any tidying up, this can be done in autumn. Remove and damaged or crossing branches and ensure there is enough light reaches the inner canopy.